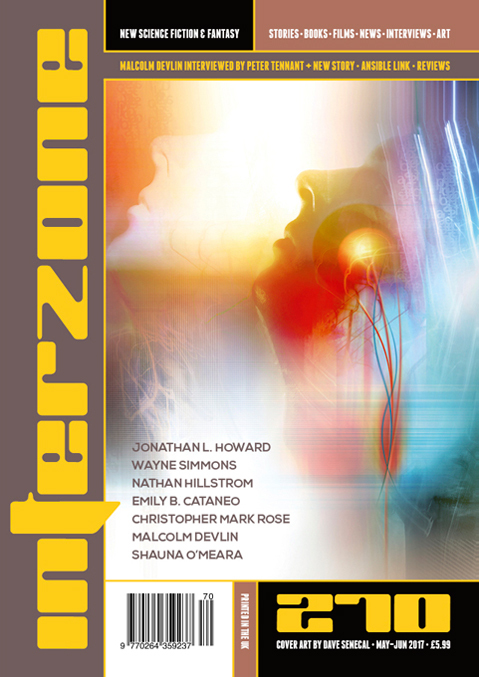 "Dirty Code," by Wayne Simmons [bio] (edited by Andy Cox), appeared in Interzone issue 270, published on May 15, 2017 by TTA Press. Pro: The imagery of the apartment, the run-down town, and the dive bar creates a perfect noir feeling. Con: Nothing is really done with it. There’s no tension to speak of, and we never figure out what’s really going on. Is the whole thing set in a virtual reality? Or is it augmented and some people really do get shot? What was the sideline? It’s all very confusing and ultimately unsatisfying.